Hi! Jen again. 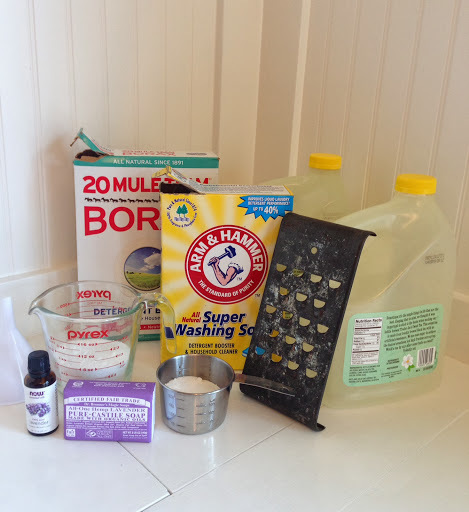 I wanted to share this recipe for making homemade lavender scented laundry detergent. 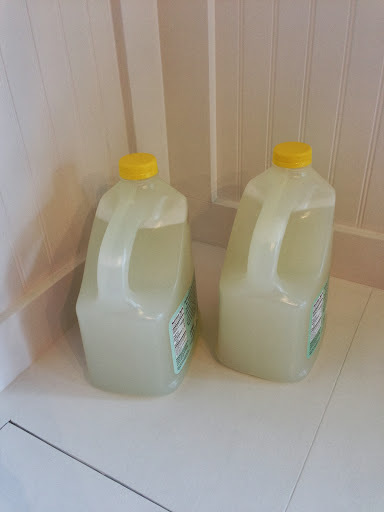 This November it will be two years that I’ve been making my own detergent. I was inspired by my crafty sister Tiffany who has been making it MUCH longer. 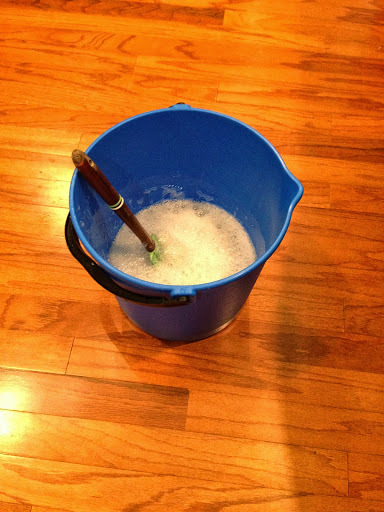 The main advantages to homemade detergent is that you know exactly what’s going in AND it will save you a couple hundred dollars a year. Yep, you heard it correctly. 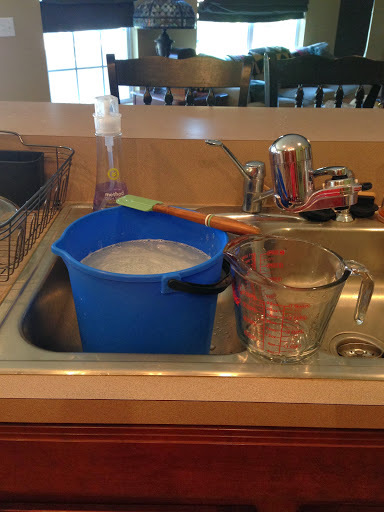 Making your own laundry detergent will save you lots of money! Many of my friends say they don’t have time but if you have twenty minutes every two months to spare, you have time. A common myth about detergent is that you need lots of foamy, soapy bubbles to get your clothes clean. Your homemade soap will clean and freshen just as well as store bought soap without any residual product on the clothing. If you want a boost to whiten whites you can add about 1/4 cup of hydrogen peroxide to your wash or just spray around shirt collars and stains. 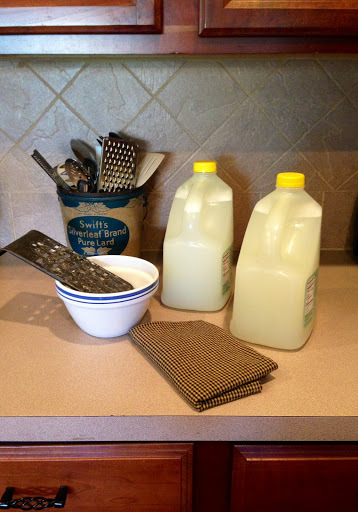 If you find that you feel empowered making your own laundry soap, you can even make your own fabric softener and dishwashing detergent. Look for that in an upcoming blog. 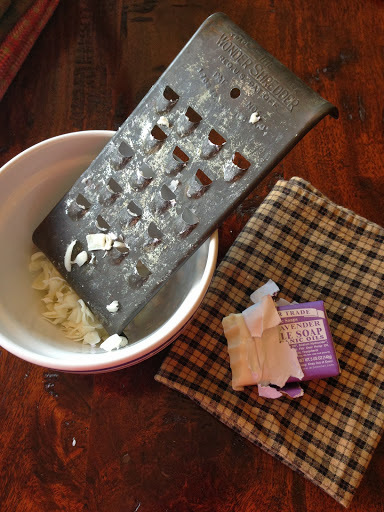 Grate either a full bar of your favorite soap (I love Dr. Bronner’s Lavender Soap) or 1/2 of a bar of Fels Naptha. 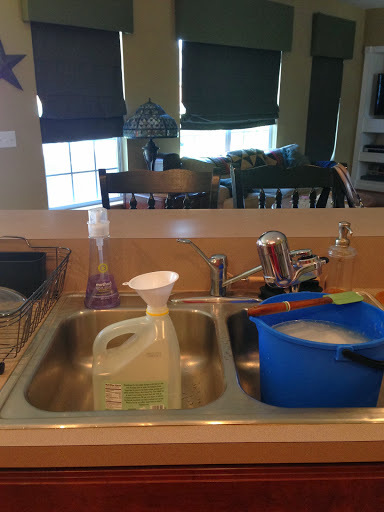 Measure out your Borax and Washing Soda. 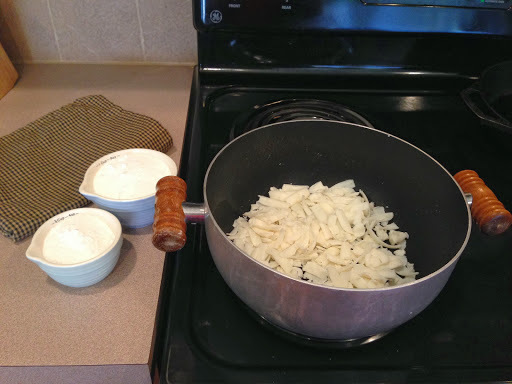 Place your grated soap flakes in your pan. 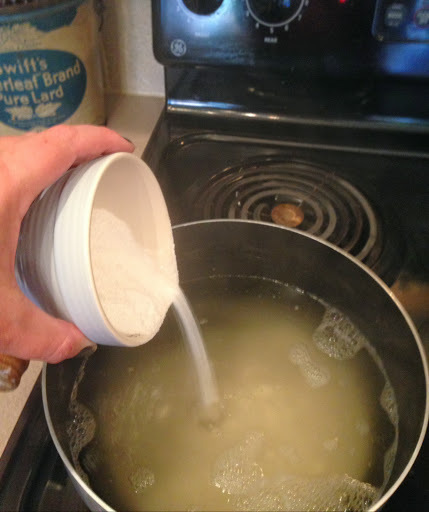 Add 6 cups of water to the soap flakes, turn on medium heat, and stir gently until soap is fully dissolved. Next add your Borax and Washing Soda and stir until completely dissolved. The mixture will begin to thicken into a gel. 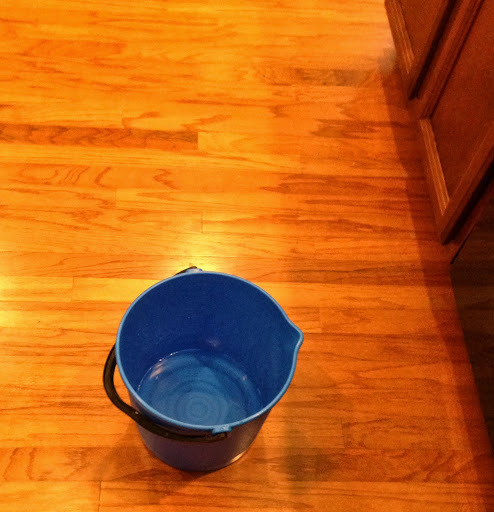 Pour 4 cups of hot water into your bucket. 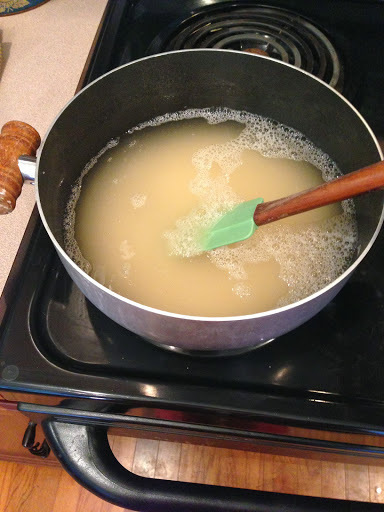 Carefully, pour the soap mixture into the bucket of hot water and stir until completely mixed. 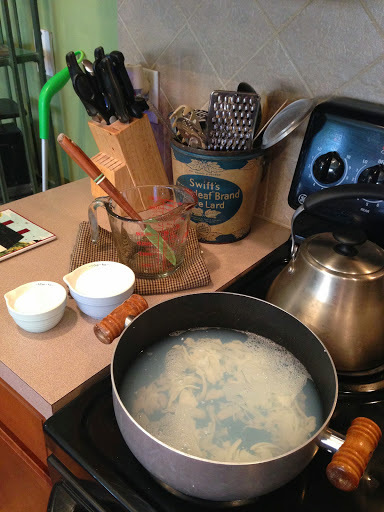 Add 22 cups (or to the 8 quart line) of water to your soap mixture. This is where the large Pyrex measuring dish comes in handy. Add lavender essential oil (or your other favorite scented oil). I use about 20 drops because my soap also has a lavender scent but you can add as much or little as you’d like. 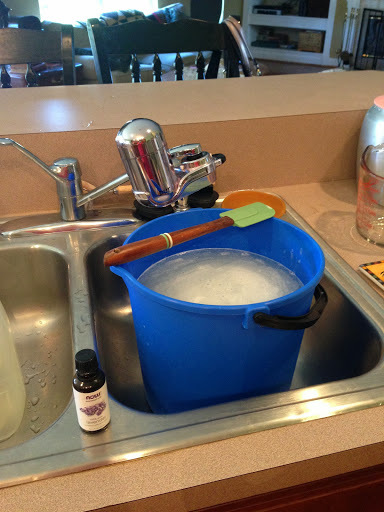 If I use Fels Naptha I rarely add essential oil because the smell is already wonderfully fresh. Using your handy funnel, pour the soap in immediately. Don’t go take a bath or sit down with your favorite TV program because the soap will begin to gel. 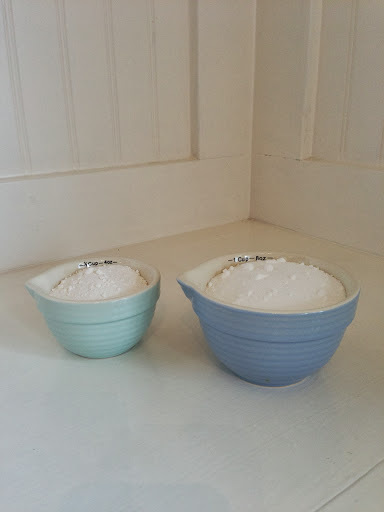 You want it to gel in the containers and not your bucket because it may form clumps while you pour and you want the gelled part evenly distributed between each jug. And look! You now have two gallons of detergent. How easy was that? I usually let mine gel overnight but I have used it just a couple of hours after making. You’ll want to give it a shake each time before using it to remix the solution in case it separates a bit. If it gets too gel-like, just add a bit more water and shake. I use a regular liquid laundry detergent size capful for each load. Organizing the Pantry…if you dare.